The idea: MeatWater. It’s a real thing. 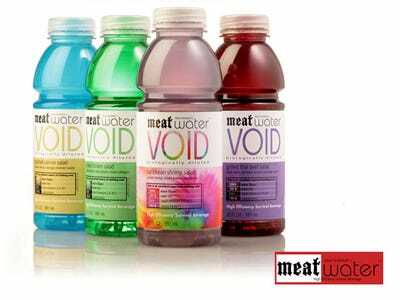 Like Vitamin Water, it’s flavored water enriched with protein. Except, instead of lemon or raspberry, MeatWater tastes like dinner, right down to the seasonings. flavours range from the gourmet (moules frites) to the pedestrian (beef jerky). Why it’s a bomb: Have you ever wanted to drink something that tastes like stuffed quail or goulash? Yeah, me neither.